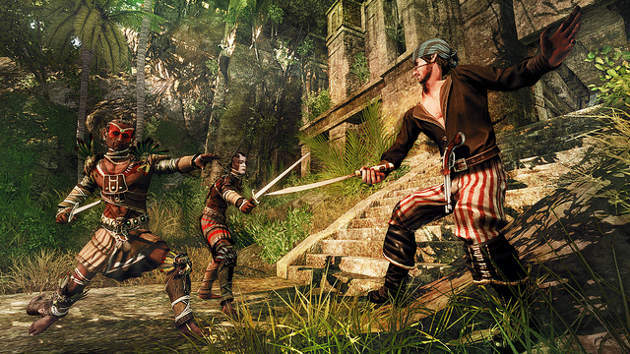 Prepare to swashbuckle it up in Risen 2: Dark Waters. Deep Silver’s expansive role-playing game offers you the early-modern career of piracy (rather than the modern counterpart of selling bootleg DVDs) in a fictional world whose environment is based on the Caribbean tropics. You’ll be fighting other pirates, the Inquisition (a religious/military group) and beasts both mythical and real. Yet for all its jungle exploring, treasure finding, monster slaying and general swashbuckling, there always seemed to be something missing. The game opens with a lot of promise. Our Hero wakes up in a dank room surrounded by empty bottles of grog and is immediately told to report to the beach and help salvage what’s left of a shipwreck. In the process the hero meets Patty, a pirate from the original Risen title, fighting for her life against a strange Anglerfish-like land creature. Patty is an extravagant and flamboyant character, like a female Captain Jack Sparrow, and your interactions with her never fail to amuse and bemuse. But even with all the entertaining dialogue and interesting characters the poor animation and mistimed gestures take away from the experience. To be honest, this isn’t a huge problem, but I often found myself ignoring the dialogue to focus on the sketchy, unfortunately humourous animations. This is a shame because the actual story line has a lot to it and the various characters have much more to offer than just unintentional laughs. The gameplay itself is refreshingly different. 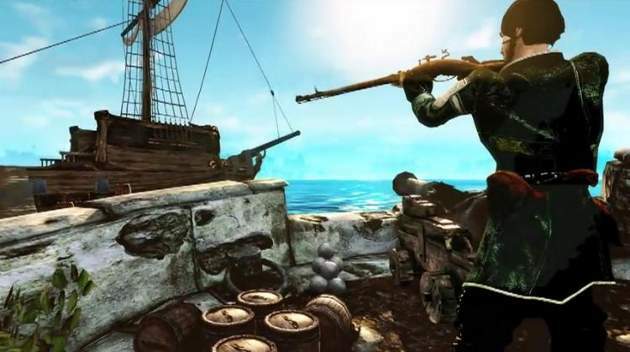 Risen 2 is no mere pirate RPG as it offers much more than plunder and rum. The story has a mystical edge to it which, oddly enough, merges very well with the overall game play. The use of black magic in the form of “Voodoo” gives the combat an interesting twist allowing the player to utilize different forms of attack to beat any enemy, big or small. Slice them with your sabre, shoot them with your musket and put a hex on them with black magic—this is pirating violence at its best. The story sees you battling the pet monsters of the Titan goddess Mara as well as trying to find ancient artefacts which promise to help defeat the Titans that threaten the city of Caldera. The hero must traverse dingy caves, beautiful jungles and ancient temples in an attempt to defeat the ever looming danger that Mara poses. The story is the real saving grace of this title. Although sometimes poorly executed, the exciting twists and turns of the story and countless side quests entice the player to explore further and play longer. All of this is wrapped up nicely in the picturesque Caribbean-like scenery of the “New World”. The story progresses nicely in conjunction with the interesting and engaging scenery and the threats that come with it. If you can ignore slight glitches and some minor repetition you will find plenty to keep you entertained. Unfortunately, Risen 2 is an unnecessarily messy end product which disappoints across the board. That’s not to say that the game is disappointing in itself, more that it’s disappointing because it had the potential to be something better. Sure these are minor bumps on an otherwise fun road, but they are bumps nonetheless. Combat can sometimes be frustratingly difficult (I must admit I have been bettered by monkeys on a number of occasions) and character animation can sometimes be a little cringe-worthy. This game had the opportunity to be something great, instead it settled for being something good. Good is good, but great is better. This title does have a lot to offer, but its potential is often overshadowed by minor flaws that could have been easily avoided. If you can overlook the technical flaws that the game displays then I guarantee that you will enjoy this game. It offers a lot for the average gamer and the story itself is enough to keep you playing through the slight disappointments that it throws in your path. The game truly offers a pirate’s life for me (and you). This is essentially what I had heard about this game; kind of good, but overall disappointing. I’m going to save my swashbuckling urges for the naval combat in Assassin’s Creed III. what a shame I picked up once at the store … Lucky i didnt have that urge to splurge would be greatly dissappointed. That’s why you should always check out reviews on a game first. Especially when you’re considering a $60 game. yeah your right about that. I’ve grabbed so many games that have disappointed or just a lack of grabbing my attention… But they all desrve to be reviewed fairly and played to the very end. By the way i saw your post on looking for volunteer reviewers may you email me the details i would like to contribute and hopefully be as good at reviewing games like this individual. Great review. Oh and how do you rate? ummm anyway of fixing this repetative… Im not doing it on purpose the comment box keeps doing it. I’m afraid the problem with duplication you are experiencing must have something to do with the way you are posting your comments, as we have never had an issue like this with anyone else, and my comments have been posting fine. If you are interested in writing for us, send us a brief summary of yourself and your goals, and a sample of your writing, by email, NOT in the comments. You’ll find the link to the contact form in the footer below. To add your own rating of the game, just click the star that equals the number of stars you want to give it in the “User Rating” section at the top of the review. So if you want to give it 4 out of 5 stars, click the 4th star. I hope this makes sense.